What a thrill it is to taste and drink Anselme Selosse’s 1990 Brut Blanc de Blancs once again. Still vibrant and fresh with little in the way of evolution since I last had it, the 1990 remains a stratospheric, towering Champagne. The flavors are vibrant and finely cut, with plenty of citrus, lemon peel, mineral and white flower nuances. The 1990 was made from two parcels in Avize that continue to inform the vintage Champagne here; Chantereines et Maladrie du Midi. Anselme Selosse told me natural sugars were in the 13.6 range at harvest and 12.8 after fermentation with natural yeasts, which then became 14.2% with the addition of sugar at bottling time, numbers that are roughly in line with 1999, but on the high side within the context of Champagne more broadly. 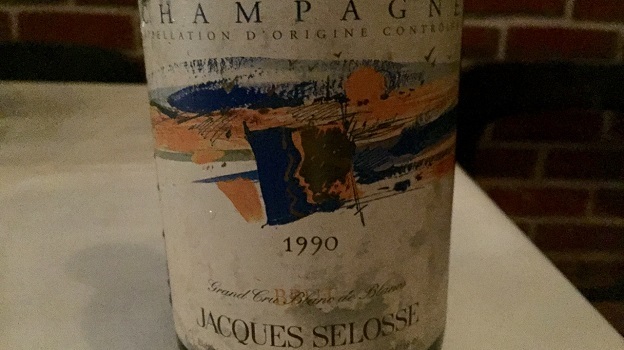 Although the 1990 was fermented in barrel, it is brighter and more focused in style than is the norm today, with essentially none of the oxidative, burnished notes that have become such a Selosse signature. Today, the 1990 shows no signs of fading; if anything it has only continued to blossom over the last few years. Sadly, the 1990 has become nearly impossible to find. Readers lucky enough to own it hold one of the most profound Champagnes of the last thirty years. 98/Drink: 2015-2025.